November 6, 2018 - The digital marketer's #1 daily briefing! The Facebook algorithm is confessing some more... And we also have a tool that could help you discover things FB doesn't want you to know. Chrome 71 wants to block more of your ads and Charles Ngo suggests an alternative. Also, influencer marketing is sometimes more annoying than media buying. Just ask Snapchat! 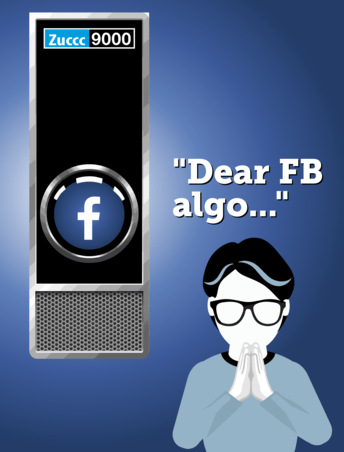 If you were surprised by yesterday’s post on the Facebook algo, it’s not over yet… Because there is more, she knows about you. Not only she knows who is more likely to buy your products. She even knows who is more likely to survive in a catastrophe. Based on data that Facebook compiled from users affected by hurricanes Harvey, Irma, and Maria, the FAIR (Facebook Artificial Intelligence Research), determined that people have different behaviour in such situations. And these behaviours mostly depends on their social circle. In fact, the data shows that people who have strong community roots are less likely to evacuate, whereas people with stronger secondary networks were more likely to evacuate. This would seem to indicate that the more exposure a person has to people outside of their locale during a disaster, the more likely they are to feel comfortable leaving home. After this, we are wondering what else she knows about us. We are worried that she discovered what is inside tomorrow’s newsletter. Please, dear algo, keep it for yourself! Instead, focus on our campaigns, and give us that sweet ROAS! We can’t lie: Facebook is going through dangerous water. During the past year, more than a quarter of US adults deleted the Facebook app from their phones. Among 18-to-29-year-olds, that number jumps to 44 percent. It’s because 74 percent of millennials and Gen Z-ers can’t stand being targeted by brands on social media. The clock is ticking and as teens and 20-somethings grow into their prime spending years, the future will belong to brands that can figure out how to connect with these people. This leads us to the big question: Where should we put our spend in a post-Facebook world? You shouldn’t put your eggs all in one basket – in this case, the one belonging to Facebook. While we see the danger Facebook is facing, we don’t see it being an ad-pocalypse as Dominic Vayana brings up here. One solution we agree with? Provide better ads. More engaging, less misleading. Perhaps less frequent too. Less creepy targeting. Things will change but digital marketing, whether on Facebook, Google, Amazon or another platform will still be around. But we affiliates are also to blame for many of the harder compliance rules. Sometimes it’s like we shoot ourselves in the foot. Google announced Chrome’s ad blocker will expand to sites with “abusive experiences”. Since February, with the release of Chrome 64 and Chrome 68 Google started fighting these unwanted tabs or windows. But more than half of the abusive experiences are still not blocked by Chrome. So with Chrome 71’s release in December, they take it up a notch. So even more bad news for pops. That’s the story of the past few months when it comes to mobile..
Why is that? Simply because you have a direct connection to the person’s phone, instead of being mediated by Chrome or another browser that blocks ads – which you can see is happening more often based on the above article. Basically, if you get the user’s consent, you can deliver push notifications. There are some parallels to email and Messenger bots too. But it’s not exactly the same. Charles Ngo recently wrote an intro to this traffic type, how you can start your own list, what tools to use and some basic stats you can expect. An average of 53.3% opt-in rate, much higher than the 2% average for email. 3-8% open rate, depending on how segmented your list is. To top it off, you can deliver multiple offers to the same person, for free, once they’ve opted in! Talk about an ROI booster! If you want to get yourself familiar with this traffic type, we recommend checking out Charles’ article right here. It’s better to deal with machines than to deal with a human. Probably, at this moment, the marketing guys at Snapchat are thinking exactly the same. In fact, Snapchat’s PR company is suing Luka Sabbat, a social media influencer with 1.4 million Instagram followers, for… failure to influence. We are not kidding! Sabbat’s gig was to promote Snap Spectacles. On Snapchat? No, on Instagram. Sounds weird? Not at all for the Snapchat marketers. In fact, they offered him $65k to post three Instagram Stories and one picture on his account. Sometimes, dealing only with Facebook’s randomness seems better, eh? The tool that does some Facebook magic, plus A GIFT for you! What Facebook magic are we talking about? Well, the sort that uncovers the secret ads and landers your competition uses. That’s MagicAdz – the tool that can show you what affiliates are really running on Facebook. OK, talk is cheap – here’s what the MagicAdz team has for you. A collection of 7 affiliate landing pages they discovered using their tool. One for each of these verticals: muscle, skin, diet, ED, crypto, gambling and sweeps. All you have to do is go to the link above, leave your email and they’ll send over the collection to your inbox right away. They want to absolutely prove the claim that MagicAdz is really an ultimate tool for Facebook Ads competitive intelligence. If you’re unsure even after seeing real landing pages, don’t worry. You get a 14 day trial for $1 to explore everything the tool has to offer. Afterwards, it usually costs $299/month. But you already know that as a WHAT THE AFF reader, you can get it for a special price – $249/month. The discount is valid as long as you keep your MagicAdz subscription active. Ultimate Airbnb snitch? A smoke alarm for noise. That’s the easiest way how to explain the new NoiseAware Gen3 device. You simply plug it into your wall socket, set it up on their website, choose a decibel threshold, and it starts collecting noise data. Pretty simple, right? But what about privacy? And what if someone just plugs it out? The snitch box company thought of that too. Privacy is no concern, as NoiseAware will not and actually can not record sound or speech. All they do is measure the decibels. And plugging it out won’t really help either. If the box goes offline for more than 10 minutes (WiFi-crash, power outage or unplugging), it will send analert to the host. If you do install them, you should let your tenants know that the noise level is measured in some way. That will help too, as people don’t really know how or where this “spy device” is. Especially useful for Airbnb hosts who want a bit of extra monitoring of their homes. With this little buddy, your tenants will keep it down. And if not, you will know before the police get called.